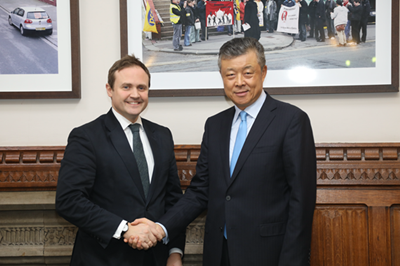 On November 30, Ambassador Liu Xiaoming met with Tom Tugendhat MP, Chair of the Foreign Affairs Select Committee of the House of Commons at the British Parliament and exchanged views with him on issues of China-UK relations and inter-parliamentary exchanges. Ambassador Liu congratulated Mr. Tugendhat on his election as Chair of the Foreign Affairs Committee. He noted that this year marks the 45th anniversary of China-UK ambassadorial relations, and it is also a year for consolidating the "Golden Era" of China-UK ties. The two countries have maintained close high-level exchanges, made steady progress in inter-parliamentary exchanges, achieved fruitful outcomes in pragmatic cooperation and strengthened international collaboration continuously. The 19th National Congress of CPC, concluded successfully not long ago, set out Xi Jinping Thought on Socialism with Chinese Characteristics for a New Era, outlined the new blueprint for China's future development, proposed the major country diplomacy with Chinese characteristics that aims to build a new type of international relations and a community of shared future for mankind, and highlighted China's commitment to making greater contributions to world peace, stability and development. The Congress not only sets the direction for China's future, but also provides historical opportunities for China-UK relations. The Ambassador expressed his hope that the Foreign Affairs Committee of the House of Commons would play a constructive role in strengthening the inter-parliamentary exchanges and cooperation, making the China-UK 'Golden Era' strong and enduring and delivering more to the two countries and peoples. Tugendhat happily recalled his visit to China and spoke highly of the China-UK relations, saying that the strength and influence of China are growing day by day. The UK Foreign Affairs Committee is willing to contribute to promoting inter-parliamentary exchanges between the two countries, enhancing the understanding of China among the people of all sectors in the UK, and sustaining the China-UK "Golden Era".